Ranging from the shattered gentility of Edith Wharton's heroines to racial confrontation in the songs of Nina Simone, American Rhapsody presents a kaleidoscopic story of the creation of a culture. Here is a series of deeply involving portraits of American artists and innovators who have helped to shape the country in the modern age. Claudia Roth Pierpont expertly mixes biography and criticism, history and reportage, to bring these portraits to life and to link them in surprising ways. It isn't far from Wharton's brave new women to F. Scott Fitzgerald's giddy flappers, and on to the big-screen command of Katharine Hepburn and the dangerous dames of Dashiell Hammett's hard-boiled world. The improvisatory jazziness of George Gershwin's Rhapsody in Blue has its counterpart in the great jazz baby of the New York skyline, the Chrysler Building. Questions of an American acting style are traced from Orson Welles to Marlon Brando, while the new American painting emerges in the gallery of Peggy Guggenheim. And we trace the arc of racial progress from Bert Williams's blackface performances to James Baldwin's warning of the fire next time, however slow and bitter and anguished this progress may be. 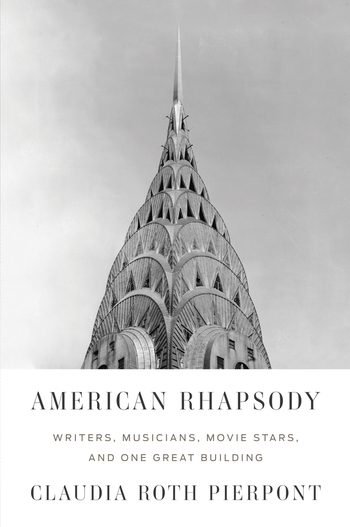 American Rhapsody offers a history of twentieth-century American invention and genius. It is about the joy and profit of being a heterogeneous people, and the immense difficulty of this human experiment. Claudia Roth Pierpont is a staff writer for The New Yorker, where she has written about the arts for more than twenty years. She is the author of Roth Unbound: A Writer and His Books, an exploration of the life and work of Philip Roth, and Passionate Minds: Women Rewriting the World, which was nominated for a National Book Critics Circle Award. She lives in New York City.